The diverging fortunes of fuel products derived from crude are influencing two oil benchmarks more than the state of supplies in the market. U.S. sanctions on Venezuelan and Iranian oil as well as output cuts by the Saudi Arabia-led OPEC+ group are creating a shortage of heavy to medium “sour” crude that's sulfurous and dense. Meanwhile, the American shale boom is generating ample shipments of cleaner and lighter “sweet” supply in the market. So it stands to reason that prices of scarce sour crude -- reflected in the Dubai oil benchmark -- should gain versus the Brent marker, which represents sweet supplies. Yet the opposite is occurring. A gauge of strength between the two shows the Middle East oil is at its weakest level since December. 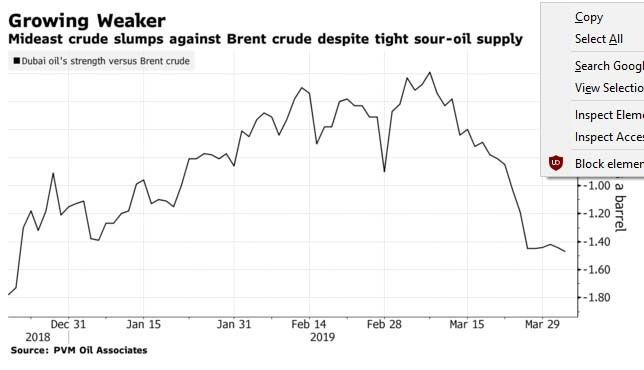 Dubai's discount to Brent, as measured by exchange of futures for swaps, widened to almost $1.50 a barrel this month, compared with 19 cents in early March, data from PVM Oil Associates Ltd. show. 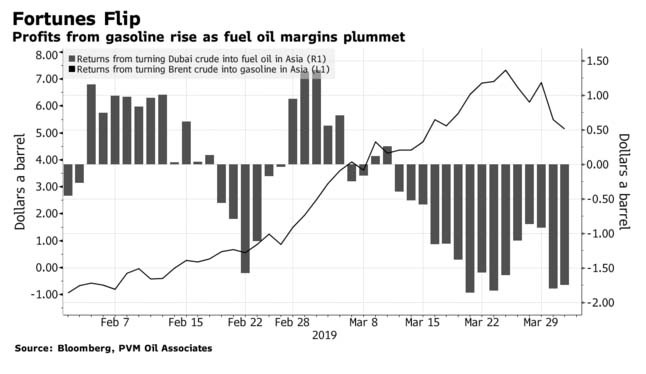 Dubai's weakness versus Brent is being spurred by the divergence in profit margins from turning crude into gasoline and fuel oil, according to a Bloomberg survey of four traders and analysts. Sour crudes usually yield more ship-powering dirty fuel oil, returns for which are tumbling. That's before strict regulations from next year mandating the use of cleaner-burning fuels in vessels traversing oceans across the globe. At the same time, returns from producing gasoline surged from a loss of $2 a barrel in late-January to a profit of more than $7 in March. Brent-linked sweet crude usually yield more of the cleaner-burning motor fuel than sour oil such as Dubai. That's boosted the relative price strength of Brent versus the Middle East benchmark, according to an April 2 report from industry consultant FGE. Story by Ben Bartenstein from Bloomberg.